If you’re looking for a suspenseful, Indiana Jones rollercoaster type ride through the world of archaeology, this DVD series isn’t for you. It’s a lecture series. That means you’re not settling in for fast-moving documentary narrated by a spellbinding disembodied voice; you’re being given open access to a revolutionary discovery in a classroom setting. And, it’s fantastic! If you’re looking for archaeological evidence that supports the record of biblical history, then you’ve walked down the right alleyway. By the time David Rohl finishes unpacking the groceries, your pantry shelves will be stocked as never before. Rohl examines the dating issues and shows why they are most likely inaccurate. This becomes a recurring theme throughout the lecture series, as the dates play an important role in the connections of various ancient rulers who can be shown to be contemporaries. The four part series walks through the evidence that supports the existence of the Israelites in Egypt from the early days of Joseph to their departure under the leadership of Moses. It highlights their route across the Sinai to the crossing of the sea and then takes a look at the Joshua-led campaign that resulted in the conquest of Canaan. In chapter 24 of the book of Joshua, as the end of his life approaches, Joshua addresses the congregation of Israel one final time, reminding them of the mighty hand of their God upon them from the departure of Egypt to the acquisition of a land filled with cities they did not build and lavished with vegetation that they did not plant. Joshua charges the nation to remain faithful and serve only the God who has so demonstratively provided. Then nation vows to do so, and Joshua erects a stone pillar to mark the commitment of the people (Joshua 24:26). David Rohl shows the viewer that stone, which still stands to this day in the exact place where Joshua had it erected. 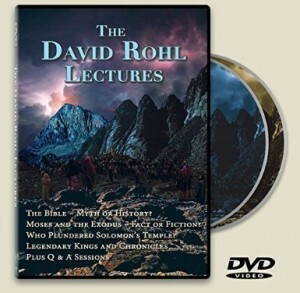 In the final two sections of the series, Rohl walks the listening audience through the period of Israel’s kings from Saul to Solomon. He identifies the historical king of Egypt who ransacked Solomon’s Temple five years after Solomon’s passing (1 Kings 14:25-26). Rohl unpacks historical (non-biblical) documents that identify events in the lifetime of Saul, Jonathan, and David. He goes on to identify David’s father, Jesse, in the documents, as well as David’s chief general, Joab. All in all, the lecture series is astounding and this review can’t possibly detail more than a small percentage of the overall material that is methodically covered. A last reminder, it is a teaching environment. If you need exciting special effects and mesmerizing dialogue to keep you on the edge of your seat, you may not appreciate this for all that it is. But, if you want historical information that runs parallel with the history of Israel as it is presented in the biblical text, then you will thoroughly enjoy this four part series.